They called her a genius. They called her a goddess. They called her a monster. Which title best fits Martha Graham, iconic Mother of Modern Dance? Find out - in the first historical novel about this great American diva. DESTINED TO DANCE is a dynamic portrait of the legendary dancer, choreographer and ground-breaker in her field. A remarkable account of an American heroine: her successes, her sorrows, and her struggles. Here is a masterful portrait of Graham, onstage, backstage, offstage. We see Graham's break-through brilliance, often compared to Picasso's or Stravinsky. We also witness Graham's triumph over alcoholism, despair, and a failed marriage. A close-up on a complex and compelling overcomer. Martha Graham (1894-1991) invented a new "language of movement," still taught around the world and exemplified in such classic works as Appalachian Spring, among 180 others. 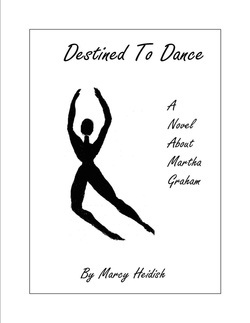 DESTINED TO DANCE is a must-read book.